Do you have questions about X-POLE? These are the most common questions we're asked. Dance4me Pty Ltd - PO Box 253, Oyster Bay 2225. Pole exercise and dance moves require friction between skin and the pole therefore the more exposed skin the better. Shorts and a crop top are ideal, bikini for the more daring. However, it is important to feel comfortable so wear what you feel comfortable wearing even if you may not be able to do some of the moves due to lack of friction. X-Pole has a range of suitable pole exercise and dance clothes on the web site. Our new silicone finish poles allow you to pole without the need for bare skin, so with these poles you can wear leggings, long sleeve tops, jumpers - even a three-piece suit if you felt like it - the costume possibilities are endless now! Q - Does the X-POLE spin? The X-Pert sets and the X-Stages can be changed between spinning and static. The Sports poles are the only static-only poles. Q - What is the pole made of? Our poles now come in a wide variety of finishes - including chrome, stainless steel, brass, powder coated and silicone. Everyone has their own preference with finish, and different finishes have different grip factors, which are listed below. Q - What is the grip factor of my pole? Q - What finish pole should I purchase? Finish is a very personal preference, with each poler preferring one finish more for different reasons. For beginners we recommend purchasing the same finish and width (or as close to) as what you are used to in your studio, as you become more advanced we recommend trying different widths and finishes so that you can swap over for comps and workshops - our stage insert poles are excellent for this, you can have multiple inserts available to practice on different widths & finishes. *A note on the Australian climate - If you live in a coastal area, an area with high humidity, or are just planning on installing your pole in a garage or shed or elsewhere that it can be exposed to the elements, we strongly recommend you purchase a stainless steel pole - it is a very similar grip to chrome however it will not rust with exposure to the elements. If you are unsure, please call or email our sales team who will recommend the best pole for your needs. Q - What about the width of the X-POLE? X-POLE is thinner than the older style 2" poles, but wider than the brass permanent poles you sometimes see in clubs. We have a range of pole widths to suit all your needs - super skinny (40mm), international standard (45mm) & old-style wide poles (50mm). Generally, it’s easier to do upside down moves and sits/laybacks on a wider pole. One handed spins are a little harder, but personally I’ve found once you master it on a wider pole, it becomes sooooo easy on the thinner poles… Great for getting your confidence up on new moves! Pole width is down to personal preference & what your previous experience is like. Feel free to email or call us if you want a recommendation. Q - How do I clean my pole? Ensure you are wiping down your pole after each use, especially if you are using grip-aids. DO NOT use water or general household cleaner on your pole - see below for the recommend cleaning method for your pole. Chrome, Stainless or Brass poles: we recommend you only use straight methylated spirits or acetone, both of which can be purchased at your local hardware store. Use this on a soft cloth and ensure you wipe down the pole thoroughly. A note on brass poles - brass is a material that will tarnish over time naturally - it tarnishes just with exposure to oxygen in the air; natural oils in your skin and other elements in the air will also cause it to tarnish. 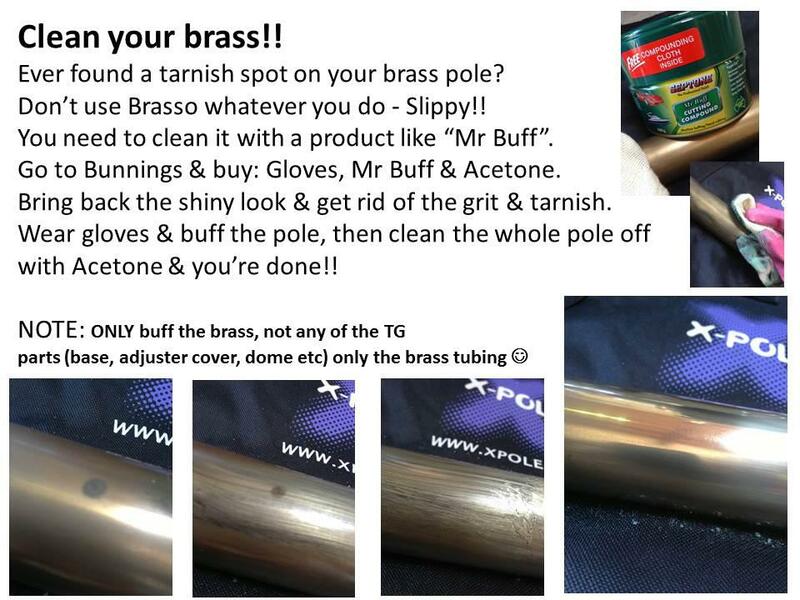 This tarnish is something that actually enhances the grip of a brass pole, and is why a brand new brass X-Pole won't be as grippy as your brass pole in a studio - this grip will build up over time & with use. You can however clean this tarnish off if you find you want a new-looking pole again, or if the tarnish is uneven and is not aesthetically pleasing - keep in mind that any extra grip that has built up will be cleaned away also. You can clean those marks off (any future marks from storing your pole) with a product called ‘Mr Buff’ – don’t use Brasso! You apparently can’t find it at every Bunnings, so you’re best going to Supa Cheap Auto and getting it from there, or call your Bunnings or local hardware store first to see if they’ve got it before you make the trip out there. Silicone poles: If you have a silicone pole you MUST NOT use acetone, methylated spirits or any other normal household cleaner. We sell a silicone cleaner on our website here: Silicone Pole Cleaner or you can purchase a silicone toy cleaner available from most adult stores. Powder coated poles: DO NOT use acetone on your powder-coated pole as you will damage the powder-coating. Below are recommendations on how to clean powder-coated surfaces to ensure the longevity for the finish. Q - What height ceiling will the X-Pert or Sports pole reach? All X-Poles are fully portable and with your X-Pert set or Sports pole you can adjust the height to many different heights straight from the box - 2235mm (7'4") to 2745mm (9'). If your ceiling is higher than 2745mm, we have height extensions available separately to take your pole up to just under 3.4m, so look at our Height Calculator if you have a higher then standard ceiling. This means you can always take your pole to a friend's house or to a hotel without any hassle! The extra wide ceiling dome ensures that even if you do have more flex in the pole (owing to a higher ceiling) it is difficult for the pole to fall. It really is the ideal solution for people who are unable to have a permanent pole! Q - How tall is the X-Stage insert pole and what are dimensions of the bases? The X-Stage insert pole is a total of 3 metres in length and it inserts into the stage all the way to the ground, so it doesn't matter if you purchase the Lite or Podium base, the overall height from floor to top of pole will be 3 metres. You need to allow 20cm clearance space between the top of pole and your ceiling. The Podium base is 32cm off the ground, giving you 2.68m of usable pole space and the Lite base is 11cm off the ground, giving you 2.89m of usable pole space. The X-Stage bases are both 1.6 metres total diameter. Q - I want to purchase an X-Stage but my ceiling is shorter than the required 3.2 metres tall - what can I do? The X-Stage insert pole comes in two halves, the A-Pole & B-Pole, each 1500mm in length. If your ceiling height is too short to allow a full 3 metre long pole to stand up, you can either cut the B-Pole shorter, or purchase a separate CX-grade extension piece to replace the B-Pole and store the unused B-Pole for later use. You MUST purchase a CX grade extension, normal extension pieces are not dual-lined which is perfect for a pole with ceiling support such as the X-Pert set, but the free-standing X-Stage needs dual-lined poles for the extra strength. Q - How much space do I need around my pole? We recommend allowing a space around the centre of the pole of at least 3 metres in diameter (so 1.5 metres away from the pole in all directions). Q - Will the pole fall over? X-POLE has been engineered to withstand the pressures of professional pole dancing. It has been designed with safety as the number 1 priority. The extra wide support dome, angular stability lock and the non-slip rubber lip and base are some of the many features used to secure your pole. Remember that the X-POLE is designed to be removable i.e. not permanently fixed to the ceiling. X-POLE is therefore obviously not designed for heavy guys to rugby tackle!! Please bear this in mind when you have guests using your pole, as your warranty will not cover big blokes feeling challenged to bring the pole down! Q- How portable is it? X-Pole is supplied in a box with carry cases. It can be carried in the box but the box will not stand day to day use. X-Pole is extremely portable. MAKE SURE YOU READ YOUR INSTRUCTION MANUALLY THOROUGHLY BEFORE INSTALLING YOUR POLE! Q - What are joists? Joists are the pieces of wood or metal that support the floors in a building. The ceiling is also normally attached to them. X-Pole uses pressure to stabilise it so it needs to be positioned against two joists. Q - How do I locate joists? Joists can be located by either tapping across the ceiling with a knuckle or with an electronic stud finder. With a knuckle you tap across until a more solid sound is heard - this is a joist or beam. A hollow sound is the space between the joists. A stud finder will locate the joist electronically (see what is a stud finder). Q - What is a stud finder? A stud finder is an electronic device that lactates solid objects such as joists, beams etc. It senses changes in density of the material it is measuring and either 'beeps' or lights an LED. Q - I have set up the X-Pert set and the spin is uneven - what is wrong? Check your manual first! The most common cause for this is the positioning of the ceiling dome and base, see pages 11-13 of your manual. Firstly, the dome must be positioned directly underneath a ceiling joist - with the joist lined up to run down the centre of the dome. If the dome is off-centre to the joist it will push up on one side when installed and cause an uneven spin. Secondly, the pole must be completely vertical - so the base must be positioned correctly underneath the dome. Use a spirit level if you are unsure if your pole is straight. There are other installation issues that can occur and cause an uneven spin - make sure you read the instruction manual thoroughly prior to installation and if you are still having trouble, email us for further assistance. Q - How long does it take to put the X-POLE up? Once you know the ceiling height, the X-POLE only takes minutes to put up and take down. The first time you put the pole up, you MUST read your manual first. This may take longer, but it will mean that you remember all the safety aspects when you put your X-POLE up! When you know how to do it, it's just a matter of working out which extension to use... and we have a chart for that! Q - Will it damage my floor? X-Pole has a soft, clear silicone pad around the base. This gives excellent adhesion to virtually any surface and also stops any damage. As with any pressure pole it is possible that marks may occur but these can be rubbed off. Q - What floors can X-Pole be used on? X-Pole can be used on virtually any floor, wood, tile, carpet etc. etc. If there is any doubt please ring our technical support department. Care needs to be taken on wooden floors which flex to make sure the pole is fully compressed. Q - Will it leave marks on my ceiling? Like the base, the ceiling dome has a soft, clear silicone ring around it. If this is kept clean and free from dirt/dust there is no reason it will mark a plasterboard or cement ceiling. We recommend wiping it down with baby wipes before installing to ensure it is clean and prevent transfer of dirt onto ceiling. If you have not cleaned the dome and it has transferred dirt onto the ceiling it can be cleaned off with sugar soap - same as any other painted surface. Q - I have a slanted/peaked/vaulted ceiling - can I still use the X-Pert set? Q - I have exposed beams and the ceiling is too high, can I install the X-Pert set on the beam? Yes, however you need to purchase a permanent ball mount to install on the beam, available from here: BALL MOUNT - Compatible w/ ALL X-PERT sets. Alternatively consider purchasing an X-Stage which is free-standing and does not need a ceiling for support. Q - I feel safer with a permanently mounted pole, do you sell these? Q - I have a floating ceiling, can I install an X-Pert set or Sports pole? The X-Pert set and Sports pole require a solid ceiling joist for installation, so they are unable to be used with a floating ceiling. Consider purchasing the free-standing X-Stage instead, you don't need any ceiling with the X-Stage! Q - I have a textured/stucco/popcorn ceiling, can I install an X-Pert set or Sports pole? The X-Pert set and sports pole require a flat surface for the dome to sit flat on, so installation with a textured ceiling depends upon whether you can get the ceiling dome flat. If the dome is able to sit flat the pole will be safe to use, however we cannot guarantee the integrity of the ceiling surface - it may start to break off or flake. Some of these older style ceiling finishes may have asbestos in them. It is recommended you get advice from a licensed builder before you install your pole, or consider purchasing the free-standing X-Stage instead. Q - What else will I need? Everything to assemble the actual X-Pole is in the box. 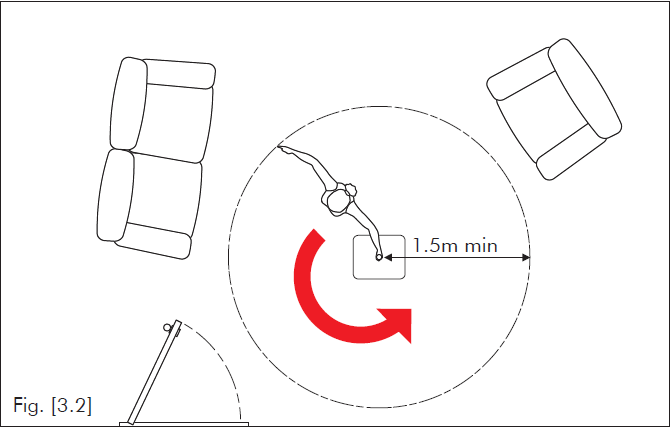 Additional items are a tape measure - to measure the ceiling height and the distance from the wall for future installations and a pair of step ladders (a chair can be used but is not recommended). Optional extras include: a stud finder to locate the joists;a spirit level to ensure the pole is straight; and a pencil or painters tape is also useful to discretely mark the pole position. Q - Has my order been sent yet? When your order is sent you will receive an email letting you know that the order status has changed to shipped and with the tracking details. Please note that it takes our warehouse 1-2 days to pick and pack your order, and they are not open on weekends or public holidays. Q - I have a query on my order/want to change my order? The easiest way to check what you have ordered is to log-in to your account on the X-Pole website using the email address and password you set up when you placed your first order with us. If you want to change your order, or have a general query about your order that can't be answered by checking your online account, please email us and ensure you quote your order number and postcode at all times when enquiring about an order. Q- Where do I find my order number? Your order number is sent to you in the confirmation email you receive when you place your order and can also be found by logging into your online account on this website. We need this order number from you when corresponding about anything to do with your order, so ensure you keep this in a safe place or are able to access your user account online. Q- Do you offer pickup from your warehouse? Unfortunately our warehouse is no longer offering pick-up of items by the general public due to OHS issues with customers entering the warehouse floor. If you are unable to take delivery of your item at home consider having it sent to your work address instead - it is sent in plain brown boxing. Otherwise, consider purchasing through one of our many studio resellers and picking it up from their studio. Note that most studio's do not carry stock so delivery times will still apply as per usual - contact your local studio to see if they are an X-Pole reseller, and if they aren't ask them to contact us to set up a wholesale account! Q - How strong is an X-Pole? X-Pole has been designed for professional dancers. It uses hi-grade steel and has screw together joints for added strength and stability. It has been used with two people dancing on it a girl and a guy! Q - How tight does the adjuster have to be? The X-Pole adjuster needs to be tight but not over tight. Tighten the adjuster and check the X-Pole for movement. Try a spin if there is no movement the pole should be fine. If there is any movement further tighten the adjuster. It helps to have someone stand on the base to compress the floor whilst tightening the adjuster. If the adjuster cover O-ring is too tight and will not slide, rub a tiny film of Vaseline on to the O-ring. DO NOT get the Vaseline on the pole. Only a very tiny amount is needed, just enough to dampen the O-ring. If too much is put on wipe off with a tissue. Cover should now slide easily. Q - I can not find the adjuster! The screw adjuster is already attached into your pole, down the bottom of the A-Pole. Q - Help! There is something wrong with my pole! Your first point of call should always be your instruction manual - make sure you read this thoroughly and understand it before putting up your pole. For other issues please email us at sales@x-pole.com.au and make sure you include your order number from when you purchased the pole/part in question. If you purchased from one of our re-sellers, please contact them for their X-Pole order number for the pole/part in question. Please also include a thorough description of the issue, along with photo's or video or the issue if applicable. Most issues are related to install and can be easily fixed with some recommendations on how to improve installation. The X-Pole Tech Team has found that the best way to remove rounded hex screws is not an extractor – which can be used as a last resort – but a Star (Torx) socket driver and a ratchet/socket wrench. Photo Below. The Star (Torx) socket can be found at most hardware stores, Torx is the official name for the product. There are 2x sizes of Star used for X-Poles a T27 for the Static/Spinning and Adjuster hex screws and T30 for the main hex X-Joint screw. It is important that you use a Socket style Star unit (as per the photo - there are different shaped bodies) as the Star shaft needs driving into the Hex screw hole with a hammer. Take the Star (Torx) socket, ensure it is at 90° to the screw hole and drive it into the hole as far as possible with a hammer. Be careful not to miss and hit your pole tube!!! With the Star socket well driven in (especially with the X-Joint screw – make sure it goes in all the way) carefully attached a socket wrench, being sure you do not disturb the socket and loosen it and gently and progressively turn it Counter Clockwise. That is the opposite way to a clock hand! The force must be applied gently and progressively, DO NOT jerk or quickly move the wrench, as this could cause the star to further round off the screw hole! The Tech Team are able to remove 99% of the rounded Hex we encounter quickly and easily with this method. If your screws are damaged in anyway please replace them immediately. Additional screws can be purchased for your local X-Pole distributor.